Ripon College started the NCAA Division 3 baseball Midwest regional with a major upset, knocking off top-seed and defending NCAA Champion Whitewater 15-7 in La Crosse on Wednesday. The 8th-seeded Red Hawks (24-14) pounded out 13 hits and moved into the winners bracket with a matchup against fifth seeded Coe (32-12) at 4:30 p.m. today. The Warhawks (33-10) now face fourth-seeded St. John’s (26-15) at 10 a.m. today in an elimination game. The host team, second-seeded UW-La Crosse (29-12), scored six runs in the eighth to pull out a 10-3 win over seventh-seeded St. Scholastica. The Eagles will take on third-seeded Washington University (34-14) at 7:45 p.m. tonight. In Waverly, Iowa, top seeded UW-Stevens Point beat sixth-seeded Greenville 7-4. The Pointers (32-12) will face Wartburg (32-13) at 3:30 p.m. today. Fifth-seeded Carthage College fell to second-seeded Webster 4-3. Carthage (28-14) will play Greenville at noon today in an elimination game. The NCAA Division 3 baseball regionals open play today around the country. Eight regional winners will be determined by the end of the weekend. Those eight teams will head to the Fox Cities for the double-elimination NCAA D-3 College World Series at Fox Cities Stadium May 22-26. Five Wisconsin teams begin play today. A total of 56 teams earned bids to the 2015 NCAA Division III Championships. The NCAA Division-3 Baseball Committee has announced 56 teams that will compete in the 2015 NCAA Division-3 Baseball Championship. The teams have been placed in eight regional sites. All regionals will use a double-elimination format. Forty conference champions qualified automatically. 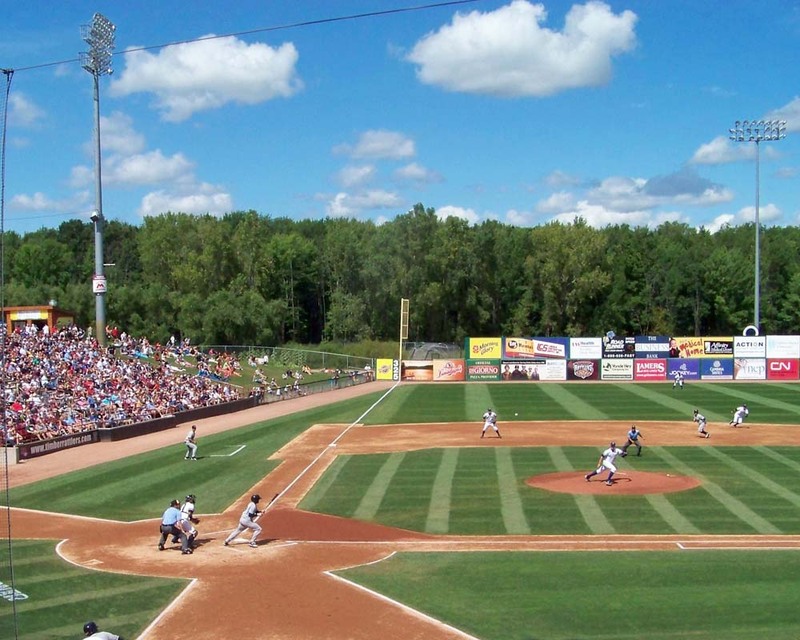 The winners of the eight regional tournaments will qualify for the double-elimination championship at Fox Cities Stadium in Appleton, May 22-27. In the 2014 championship game, UW-Whitewater defeated Emory 7-0. The Warhawks became the first program to win a football, men’s basketball and baseball national championship all in the same year. A total of five Wisconsin teams help make up the 56 team field. In the Central Region, which is being hosted by Wartburg (Waverly, Iowa), both Carthage and UW-Stevens Point make up the 6-team field. In the Midwest Region, La Crosse received one of the tournaments at-large bids and will host the 8-team field. Defending NCAA D-3 champion Whitewater is also in the field. Midwest Conference champion Ripon is also among the teams in the region. Regional play begins on Wednesday. 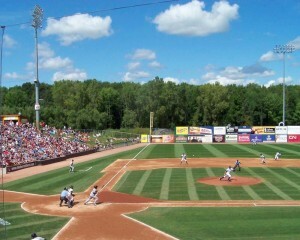 Fox Cities Stadium will host the upcoming NCAA Division 3 baseball championships. Stevens Point and Carthage College both secured automatic berths in to the NCAA Division III Baseball Tournament. The 13th ranked Pointers knocked off host UW-Whitewater 15-7 to win the WIAC Tournament Championship. Stevens Point (31-12) pounded out 14-hits against seven pitchers to come from behind to beat the Warhawks. Whitewater pitchers 11. 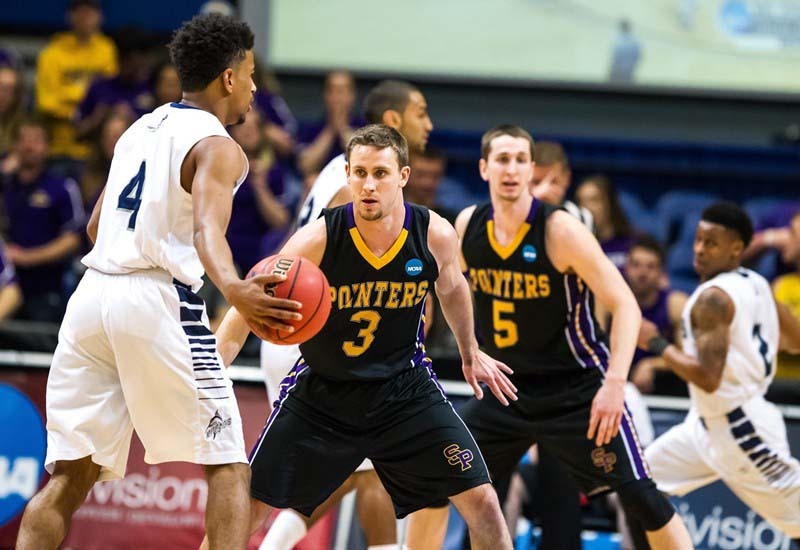 Stevens Point heads into the NCAA tournament having won 12 of their last 13 games. Carthage College entered the College Conference of Illinois and Wisconsin tournament as the fourth-seed, but pounded out 18 hits in a 12-2 win over Illinois Wesleyan in the championship game. Carthage (28-13) pitchers allowed just 11 runs in four games. Photo Courtesy of UW-Stevens Point Athletics. For the fourth time in the last six year, the Wisconsin Intercollegiate Athletic Conference can claim ownership to the NCAA Division III National Champion after the UW-Stevens Point Pointers upended Augustana (Ill.) 70-54 in Salem, Va.
Four Pointers scored in double figures, led by senior Austin Ryf’s 17 points. Joe Ritchay scored 15 points, followed by Stephen Pelkofer’s 14 and Alex Richard’s 12. 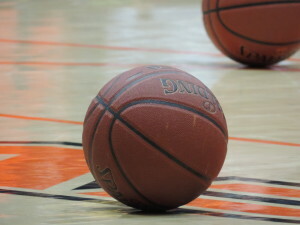 The Pointers shot 55.3 percent from the field and connected on 12-of-18 3-point attempts. UW-Stevens Point will attempt to win their fourth NCAA Division 3 men’s basketball championship when they face Augustana (Illinois) (27-4) in today’s title game (2 p.m. – CBS Sports Network). The Pointers knocked off Virginia Wesleyan 68-59 on Friday night at the Salem Civic Center to advance to the national title game for the fourth time in program history. The Pointers are 3-0 in their previous three attempts, with the last NCAA Championship coming back in 2010. Austin Ryf led all scorers with 21 points to lead the Pointers (26-5). 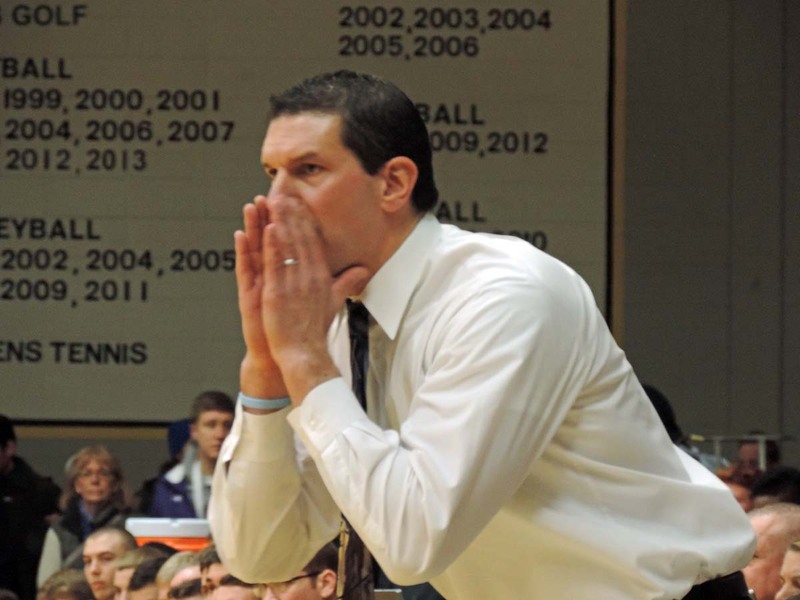 Augustana beat Babson (Mass.) 68-48 in the other semifinal game. Pointers Celebrate! – Photo: UW-Stevens Point Athletics. The UW-Stevens Point men’s basketball team is getting ready for the programs fourth Final Four appearance and first since winning the 2010 National Championship. The Pointers will face Virginia Wesleyan, who defeated top-ranked Randolph Mason 49-47 on Saturday, in the Final Four on Friday night 7 p.m. in Salem, Virginia. The Pointers advanced by beating East Texas Baptist 45-28, setting a new NCAA record for fewest points allowed in a NCAA tournament game. Stevens Point entered the game with the nation’s top-scoring defense (55.5 ppg) and held East Texas Baptist to 48 points under its season average. 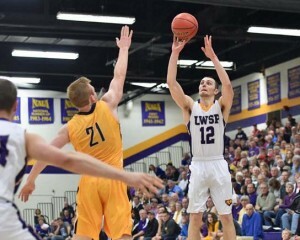 Stephen Pelkofer – Photo: Courtesy of UW-Stevens Point Athletics. Stephen Pelkofer scored a career-high 20 points and the eighth-ranked UW-Stevens Point Pointers knocked off 11th ranked Emory 73-53 in an Elite 8 matchup at Bennett Court at Quandt Fieldhouse. Stevens Point (24-5) and Emory (22-6) were meeting in the Round of 16 for the second straight season. The Pointers victory sets up a matchup with East Texas Baptist in the Elite 8. It’s their first Elite 8 appearance since 2010. East Texas Baptist knocked off Northwestern (Minnesota) 70-46 earlier. The Pointers improved to 9-4 all-time in the sectional rounds and 6’2 in the Round of 16. 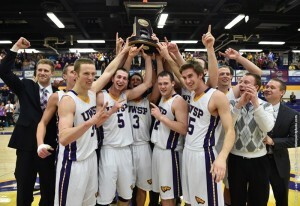 UWSP is now 33-10 all-time in NCAA Tournament play and 15-4 at home. Pelkofer made 8 of his 14 shots, including 4 of 8 from beyond the arc. Teammate Austin Ryf scored 13 of his 18 in the second half. The Pointers face East Texas Baptist for the first time tonight (7 p.m.). The winner gets a spot in the NCAA D-3 Final Four in Salem, Virginia. For the second straight season, UW-Stevens Point and Emory are meeting in the NCAA’s Division 3 Round of 16. The 8th ranked Pointers face the 11th ranked Eagles tonight at the Quandt Fieldhouse (8 p.m.). Stevens Point is in the sectional round of the NCAA Tournament for the second-straight season and the eighth time in program history. The Pointers are 8-4 all-time in sectional play and are 5-2 in the Round of 16. They’re also 6-1 at home in sectional rounds. When NW-St. Paul upset 3rd-ranked St. Thomas in the first NCAA D-3 Regional semifinal, things appeared to be stacking up for host (5) St. Norbert College to potentially make a nice post season run. What the Green Knights didn’t count on was another upset in the second semifinal. Unranked Elmhurst (Ill) College beat St. Norbert College 110-98 in triple overtime, which means the Green Knights still haven’t gone beyond the second round of the tournament. The Bluejays extended play with big baskets at the end of regulation, then again in the first two overtimes. Elmhurst junior guard Kyle Wuest scored a career-high 32 points to send Elmhurst (20-7) into the regional final Saturday night against the University of Northwestern-Saint Paul. St. Norbert senior center Steven Hofacker had 21 points before fouling out to lead the Green Knights. Sophomore guard Ben Bobinski added 16 points off the bench. The Green Knights saw their season come to an end at 25-2.